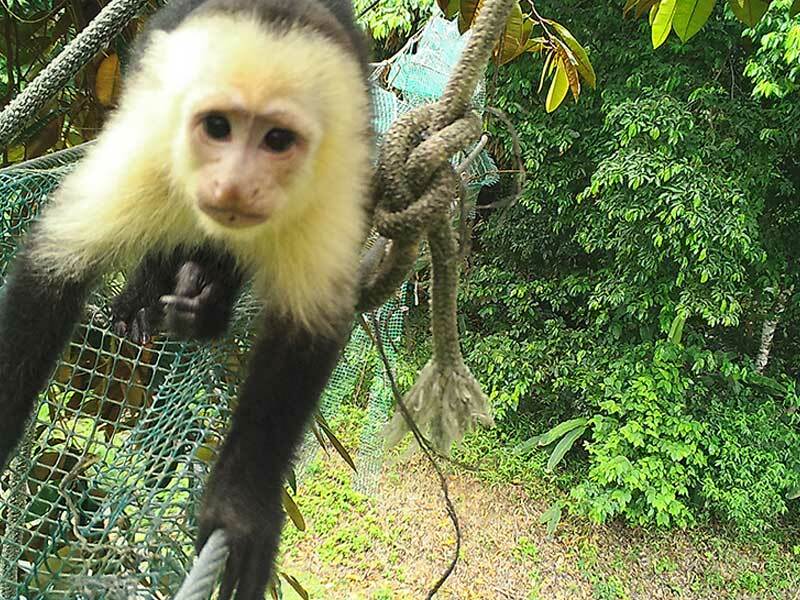 Some people call them “Monkey Bridges”, and it is true that monkeys use them more than any other species, but not exclusively. Many years ago we hung a water pipe over the narrow gravel road in front of our house. 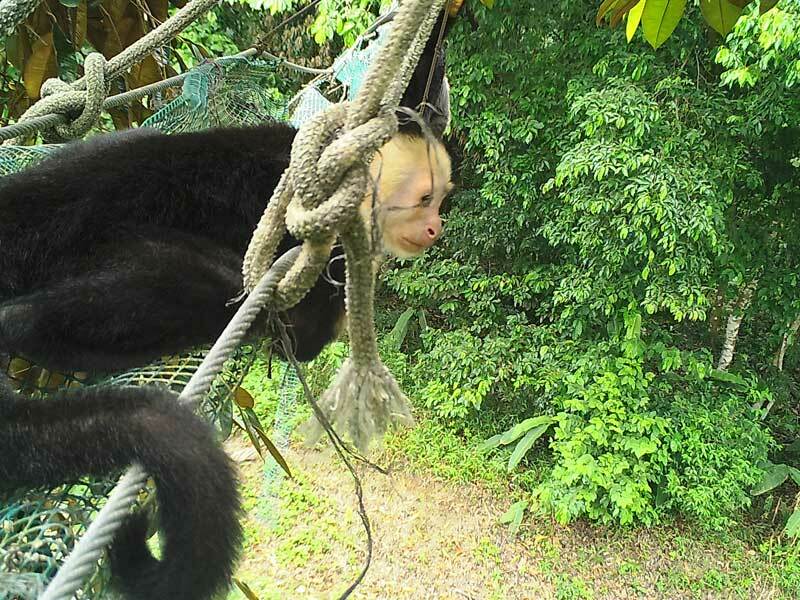 Though it was never intended to be an animal crossing at least five different species were seen using the 10 meter long pipe as such: monkeys, kinkajous, olingos, tamanduas, and opossums. When the new highway was in the planning stages we at Hacienda Barú negotiated to include underpasses and overpasses in the Environmental Impact Study with the objective of facilitating wildlife crossings and mitigating road kill. A number of mammals started using the tunnels right away, but we didn’t see anything on the bridges for a year and a half. 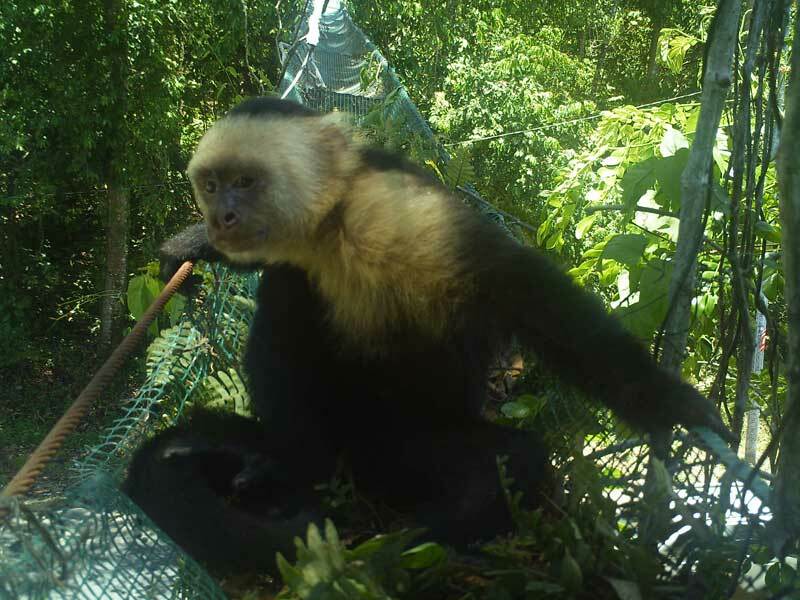 The white-fronted capuchin monkeys finally started crossing the shortest bridge, 26 meters. They soon began using another 34 meter crossing, but three more years elapsed before we saw them on the longest bridge 63 meters. In May of 2018 we decided to place some trail cameras at each end of the bridges to document the different species that use them. During the eight years since these overpasses were hung across the highway we had seen only monkeys, a kinkajou, and a porcupine. 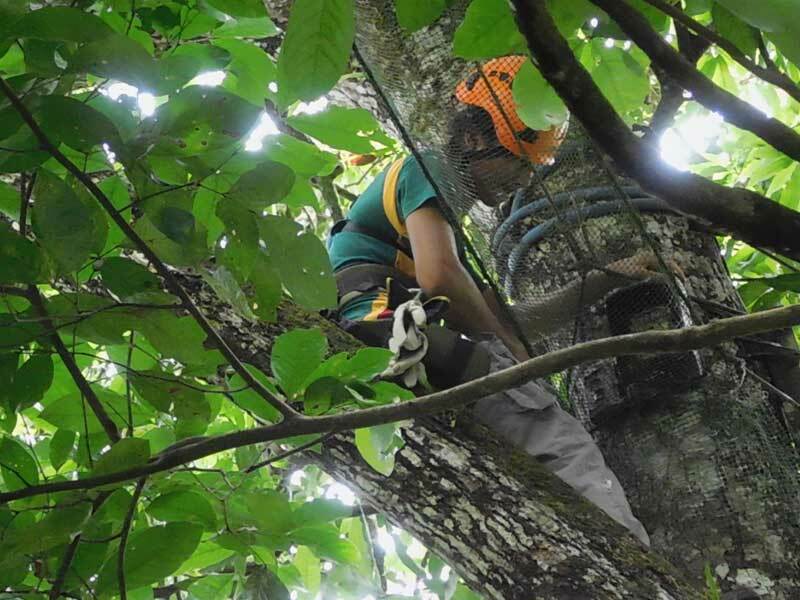 Hacienda Barú guide Rigo Pereira climbed the anchor trees and attached the cameras. 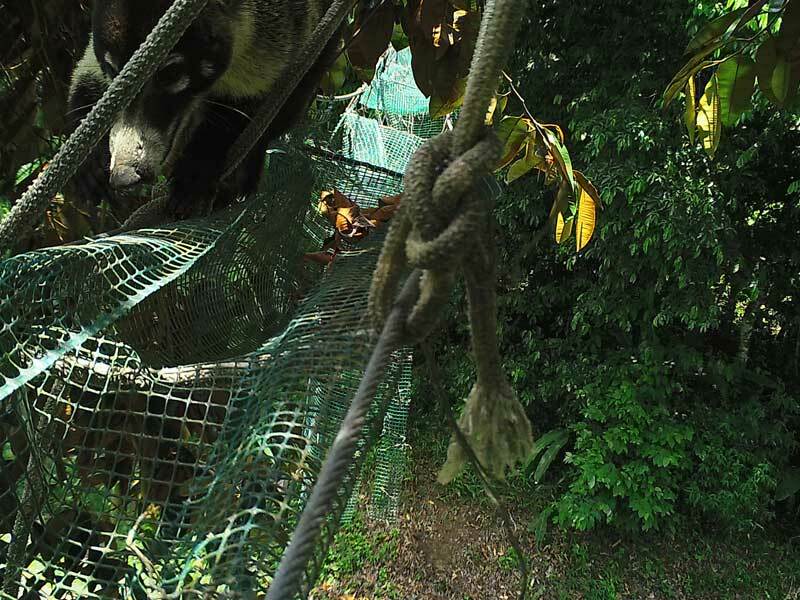 To our delight, in addition to the species mentioned above, the cameras recorded three-toed sloths, two-toed sloths, coatis, wooly opossums, common opossums, and an unidentified species of feline. To our knowledge no cat has ever been recorded using a wildlife bridge. This cat has been photographed on many different nights on the same bridge, usually around 2:00 am. 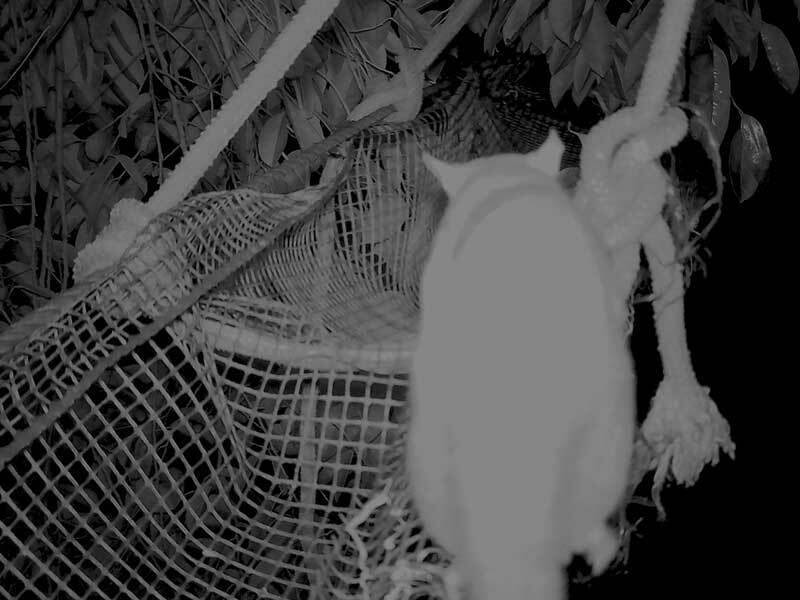 A trail camera uses infrared light for nocturnal photos, and if the animal is close too the camera the image is white and blurry. For that reason the cat´s markings are not visible, and we have been unable to identify the species. We are hoping it is a margay cat, but from.